2018 Top 50 True Freshman DL’s and their Impact on the Season. Today we will move on to my 2018 Top 50 true freshman defensive linemen and their impact on the season. This past year only 38 (76%) contributed in some way this past year. Of the 38 only 15 players had over 10 tackles, and only 3 of them were in my Top 10. Four players on list had more than 25 tackles. PS#1 Xavier Thomas of Clemson had 43 tackles and 3 sacks. Oklahoma’s Ronnie Perkins (PS#20) with 37 tackles and 5 sacks. 3rd was Stanford’s Thomas Booker (PS#32) with 28 tackles and 3.5 sacks. Jordan Davis (PS#39) of Georgia 25 tackles 1.5 sacks. Twelve players recorded at least 1 sack. PS#20 Ronnie Perkins led the bunch with 5 sacks. PS#32 Thomas Booker of Stanford and PS#50 Alim McNeill of NC State came in 2nd each with 3.5. Tackles for loss on this list were scarce as a total of 30.5 tfl from all 38 players. This year’s class outperformed the previous year’s class. In 2017 the true freshman defensive lineman had 18 players contribute for a total 194 tackles, 23 sacks and 20.5 tackles for loss. The 2018 Top 50 true freshman defensive linemen contributed 378 tackles, 27.5 sacks, and 30.5 tackles for loss. 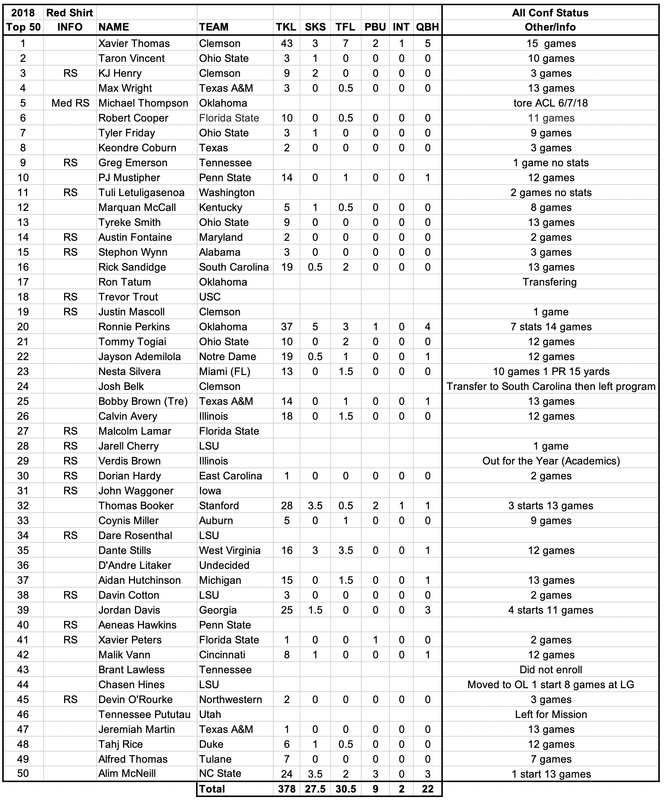 Here is the complete list of my Top 50 defensive lineman from 2018. Top 50 True Frosh DL’s for 2019. On Friday we will continue on the Top 50 list with true freshman linebackers.